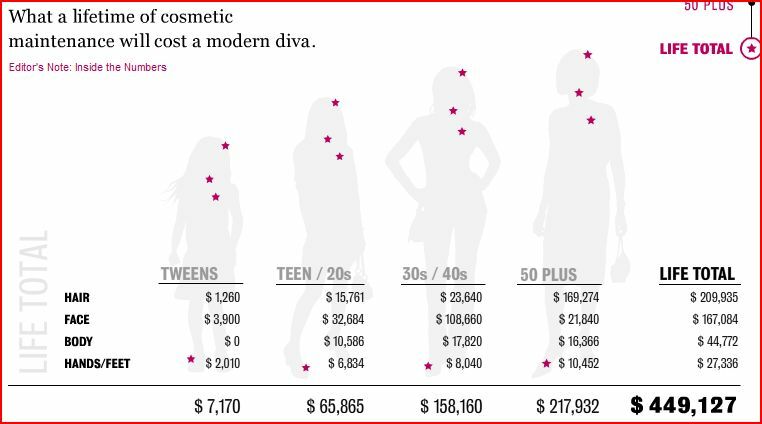 An interactive graphic at Newsweek allows us to explore the amount of money women spend on beauty by their tweens, teens, 30s/40s, 50s, and, then, over the course of their lifetimes. Below is a screenshots of the summary, click here to visit the graphic, and visit here for details on the numbers. That's why I don't shave or wear makeup on a regular basis. It's expensive, and has no real purpose. Interesting that they use the term 'diva' for the average (?) woman, who is generally less driven by some exceptional vanity than she is bound by the sexist sociocultural norms for females to be, at all times, eye-candy for the male gaze, or risk social and economic/occupational sanctions. The invocation of the term implies that women are to blame for their own oppression under patriarchy. Oh, that's interesting. One of the other bloggers at my place did a little survey among readers about the amount we spend on beauty rituals every year, and then listed what else the cost of a manicure could buy, etc. It's such a double-bind, Vidya. We face sanctions if we opt out, but it costs a lot to partake, as well. Oh, the life of a "diva!" This isn't supposed to refer to to the average woman. Do you really think the mother of an average tween spends 7000 on her daughter's beauty products? It's really a pretty pointless graph. Vidya, I was going to comment and make the same observation. By using the term "Diva," the report places the blame firmly on the woman and fails to allow for a more meaningful analysis. The phrase "cosmetic maintenance" is just.... sad. If you look at the breakdown of how they arrived at these figures, you'll see that they're definitely NOT talking about the average woman -- they're talking about a woman/girl who basically gets every "cosmetic maintenance" procedure done, starting as early as possible and spending as much as possible. The "tween" (8-12), for example, is calculated as spending $15 a week on cosmetics and $42 per haircut (every two months), and getting a manicure and pedicure 6 times a year. From thereon out, every life stage has a battery of procedures listed, including hair highlighting, microdermabrasion, eyebrow grooming, waxing, laser hair removal, indoor tanning, Botox, Restylane, varicose vein treatment, chemical peels, and $100/month on cosmetics. And it's assumed that these procedures will be done on a regular basis. So, clearly this is not representative of the average woman. But the Newsweek article's use of the term "diva" not only doesn't make it clear that they're NOT talking about the average woman, it also gives no indication whatsoever about what proportion of the population we're talking about here. I'm going to guess 1% or something equally small, because even the number of people who COULD afford a lifestyle like this if they wanted it is staggeringly small. I have never met ANYONE who does even a fraction of these things. Granted, academia isn't the field where one would expect to run into these "divas," but I've known some pretty wealthy people. The question then becomes, what is the value of reporting about something like this as though it's an epidemic? What is lost from the discussion of women and compulsory beauty routines when the reporters focus on only the most extreme examples of female behavior? And is this focus on "extremes" (and, more importantly, this treatment of the "extremes" as representatives of normality) more common in stories about women's behavior as opposed to men's behavior? I second Vidya and SarahMC. Patriarchy either damns us financially if we partake in beauty/grooming, or damns us socially if we don't. "Patriarchy either damns us financially if we partake in beauty/grooming, or damns us socially if we don’t." It also damns us financially even if we don't partake in it, as occupational opportunities, raises, promotions, and socioeconomic mobility through marriage are all much more limited if one tries to 'opt out' from regimes of 'compulsory' beauty. I would be more interested to see how much an "average" woman spends on beauty products and services. also...I doubt the beauty treatments do as much to enhance women's appearance as they think they do...as they are led to believe by marketing. most are likely a scam. however, women who just naturally fit the social definition of "beautiful" certainly have more opportunities than those that don't. I would be very much interested in how much more women spend compared to men. Also interesting: the comparison in a long term perspective. I guess that the difference will diminish along the years. Why do women pay double the price at the hairdressers anyway? The question then becomes, what is the value of reporting about something like this as though it’s an epidemic? also…I doubt the beauty treatments do as much to enhance women’s appearance as they think they do…as they are led to believe by marketing. most are likely a scam. however, women who just naturally fit the social definition of “beautiful” certainly have more opportunities than those that don’t. This may be petty, but as somebody in the 'teens/20s' demographic I resent that that silhouette looks awkward and self-conscious - toes pointing inward, pelvis inexplicably thrust forward - where all the other figures have a perfectly reasonable stance. Why on earth has this been done?